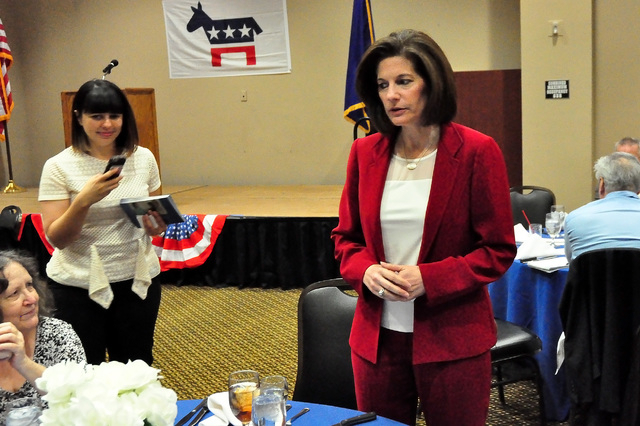 Nevada governments must utilize natural resources in rural counties, such as Nye, to create jobs and provide sustainable energy, U.S. Senate Democratic hopeful Catherine Cortez Masto said. The rural areas in Nevada have an abundance of natural resources such as wind, solar, and geothermal energy, that have the potential to create good-paying jobs and provide sustainable energy, Cortez Masto told the Pahrump Valley Times. “The federal, state, and local governments must fully utilize the natural resources in rural areas and I will work with Democrats and Republicans in the Senate to create jobs and secure a clean energy future for residents in all areas of Nevada,” she said in an email. Cortez Masto, a former two-term attorney general, actively campaigns ahead of the November election, where she is expected to compete for outgoing U.S. Sen. Harry Reid’s seat. Since launching her bid for the U.S. Senate a year ago, Cortez Masto picked up endorsements from several prominent Nevada Democrats including Reid, former Nevada Gov. Richard Bryan, and Latino leader Otto Merida. On Tuesday, Nevada’s American Federation of Labor and Congress of Industrial Organizations (AFL-CIO) announced its endorsement for the Cortez Masto campaign. “As Nevada’s next senator, my first priorities will be working to protect and pass initiatives that benefit hardworking Nevada families,” she said. Among her main priorities, Cortez Masto named increasing the minimum wage, passing comprehensive immigration reform, passing equal pay for equal work, and ensuring “world-class education” for Nevada’s children. Cortez Masto sought to draw a stark contrast between herself and her main contender, Republican U.S. Rep. Joe Heck. Heck currently represents Nevada’s 3rd Congressional District that includes most of unincorporated Clark County south of the Las Vegas metropolitan area. It covers Henderson, Laughlin and Searchlight. He successfully fought off Democratic challengers since he got into his seat in 2010. Cortez Masto outraised Heck in the first quarter of 2016 garnering over $2 million from more than 22,000 donors. If elected, Cortez Masto will be Nevada’s first female senator and the first Latino senator in U.S. history. Cortez Masto said Nye County and all of rural Nevada are critical to the “diverse and growing economy” that makes up the state. “Additionally, I will fight to increase investments in Nye County’s infrastructure and education system, as well as ensuring every rural community has access to high-speed broadband, and small businesses have access to necessary capital to keep and create jobs,” she said. “Federal, state, and local governments must work together to preserve our state’s many public lands,” Cortez Masto said. “Proposals to hand over public lands to the state put in the cross hairs the places Nevadans love and millions come from all over the world to visit,” she said. Cortez Masto faces three opponents in the Democratic primary June 14, and is expected to emerge to face Heck, who is anticipated to win the nine-candidate Republican primary.